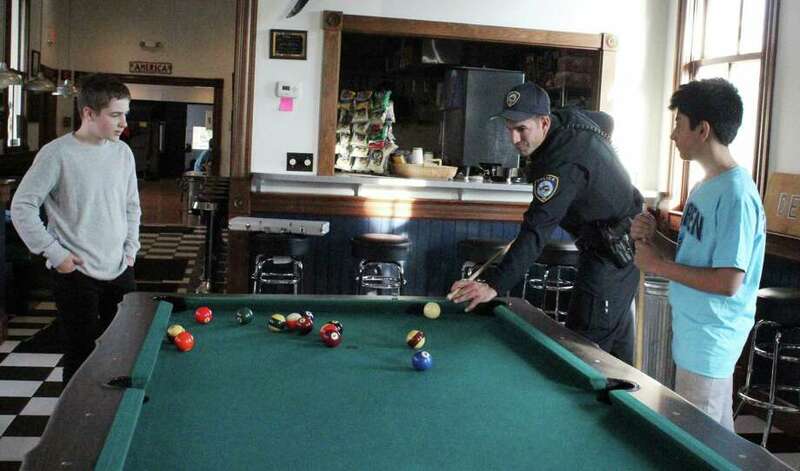 Officer Joe Cusano plays pool with students as part of the Darien Depot's Cops and Kids program. DARIEN — It’s not unusual for laughter and the sounds of floor and table hockey to echo throughout the Darien Depot on a Saturday afternoon. But what was unusual this particular day in November was with whom the kids were playing. “Hi, Ali!” cried one enthusiastic, towheaded sixth-grader at the sound of the front door opening. The sixth-grader wasn’t greeting a fellow student, instead offering a high-five to Sgt. Ali Hudyma, of the Darien Police Department. Different members of the Darien Police Department have been spending time with local middle schoolers once a month as part of the teen center’s Cops and Kids Adventure program. In its eighth year, the program incorporates team-building activities to build relationships between Darien officers and middle school students to create a common ground of understanding. For the first three years, the program ran on a grant from the state Department of Education, written by Darien Officer T. Courtney Isaac. When the grant was up, the Darien Police Department and the town chipped in the $10,000 a year it takes the program to run, using money from the town’s false alarm fund, accrued from the fines associated with accidental alarm calls. Most of the program money goes toward buses and costs associated with field trips, like last month’s group outing to Empower Leadership Sports and Adventure Center in Middletown. Many of the kids in the program were invited by officers who felt they could benefit from it. Ryan Harnisch is in his second year of the program after Isaac and Officer Dan Ehret invited the Middlesex Middle School eighth-grader to participate. The invitation was prompted after the two officers sat at the eighth-grader’s lunch table when visiting the school one day and found the 13-year-old wouldn’t talk to them. Ehret said the impact of the program is more than evident. Ehret has been participating in the program since its inception, but even officers new to the department are chipping in. Officer Joe Cusano, who started in the department last year, invited Connor O’Neill, 11, when he met the sixth-grader while working a traffic patrol during a tree cutting on Connor’s street. Connor said before joining Cops and Kids this year, he was scared of police officers because of their guns and Tasers. “I’ve learned they actually have fun lives,” he said. “When he comes in here, we give him big-brother-type lessons,” Cusano said. Cusano is a newcomer to the program, which brings in regular officers, pending who is on duty and available to stop by or pitch in for field trips. Sometimes officers will join in even when off duty, taking time away from their families for the sake of the program. After an hour of games, the kids and officers form a circle led by Ehret. He passes around a red rubber “talking ball” while asking the kids questions about themselves so they all can get to know each other. On that November afternoon, when Cusano shared he is in grad school, the middle schoolers broke into affectionate applause. Ehert asked the students about their last field trip to Empower and what it taught them, before shifting the conversation to a more serious topic: the perception of police officers. The ball bounced around the circle as kids threw out suggestions, such as the officers giving a speech about their jobs and hiding their guns when out on patrol. In a shaky voice, one student described a bad experience with an officer who questioned him after he was a witness to a fight. He said although he was only being questioned as a witness, the officer made him feel like he was in trouble. “It really intimidated me,” the student said. The officers took note of the experience and what could have been done differently. But many of the kids had overwhelmingly positive feelings about the officers.